Polthaus Workshop: It's Better To Burn Out Than To Rust. In addition to fighting rust in the workshop, I also have this nasty habit of bringing it home. 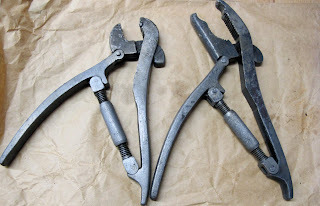 Because I have, ahem..."difficulty," saying no to a good antique tool find, I frequently end up with tools that need a serious cleaning (read: "I have an inability to resist rusty tools"). If a tool is beyond a little clean up with a Sandflex rust eraser I get out a brass brush and some magic rust sauce. Fortunately for me, I haven't been reduced to creating some rust removing concoction on my own (my grades in chemistry might indicate that I'd blow up something anyway). I buy an off-the-shelf rust remover called Evapo-Rust that works through a process called selective chelation. Through the process of chelation a chelant molecule bonds with a metal molecule and holds it in suspension. Different solutions can bond with different metals in chelation, the chelating agent in Evapo-Rust bonds with iron oxide. The iron oxide type we are referring to here is mainly rust. The rust molecules have a weaker bond with the steel in the tool than the strongly bonded iron molecules so the process only removes rust and leaves the rest of the iron alone, hence the term "selective" chelation. I use this stuff all the time and I love how well it works. 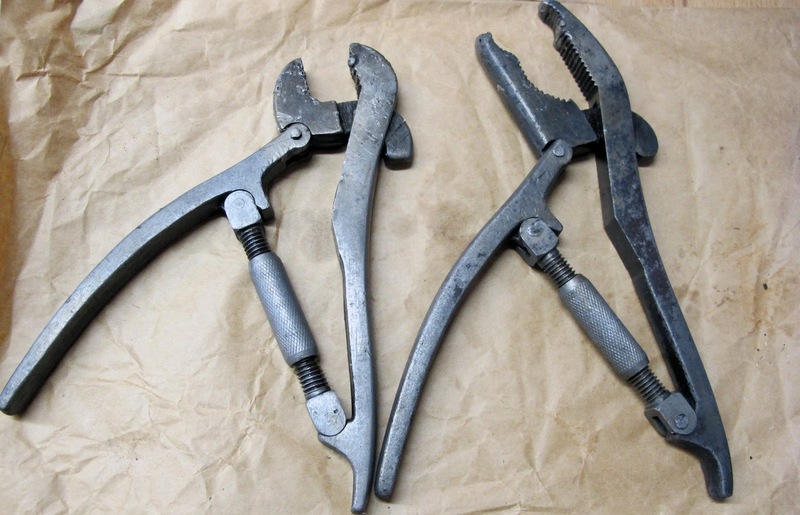 I can soak a tool for a couple hours, or overnight for heavy rust, and give it a light scrub with a brass brush or a stiff bristled nylon brush to remove the rest. Then I rinse it in a little water, dry it, and oil the tool liberally. This stuff has removed some of the worst rust I have ever encountered, while not harming the tool, and because it is a liquid it gets into all the little nooks and crannies that sometimes hide rust. Additionally, the liquid can be reused quite a few times before it is spent so I keep it in a bucket with a lid and use it until it turns black (it is normally green but it turns jet black once it is saturated with rust molecules). If you don't like the thought of using an off-the-shelf chemical, I have found that a 10% molasses solution in water works equally well, although it is much slower to remove the rust. Another magical process is electrolysis, rust removal with a small electric charge. I have tried electrolysis, but to be honest I prefer chelation because it is fast, easy, and I have repeatedly had good results. 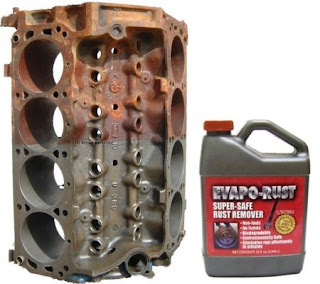 Many hardware stores sell Evapo-Rust (including Harbor-Freight), I have even found it in a 5 gallon bucket at a local mom and pop store. As per usual, I am not affiliated with this company in any way, I just like products that work as advertised. 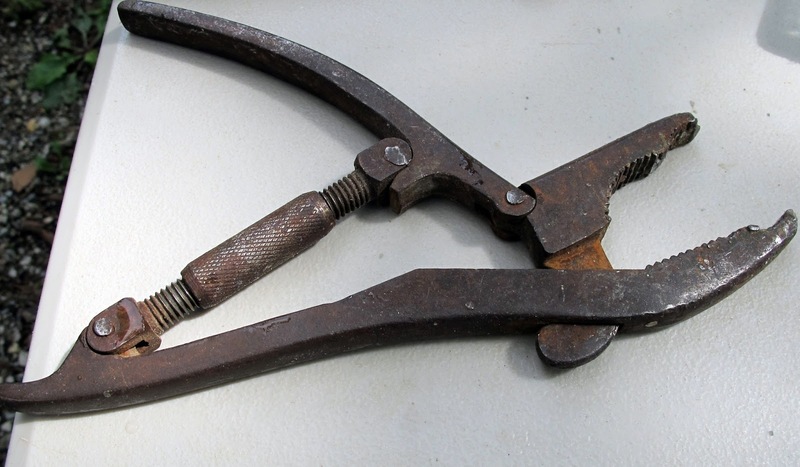 If you are looking to do some rust removal, put down your sandpaper and naval jelly, and go get your chelation on!